Former football coach Don Nehlen’s son scrawled it on construction paper with crayon? Well, then, it actually originated when one of the ball boys saw clouds in the sky forming a W and V together during a scrimmage? 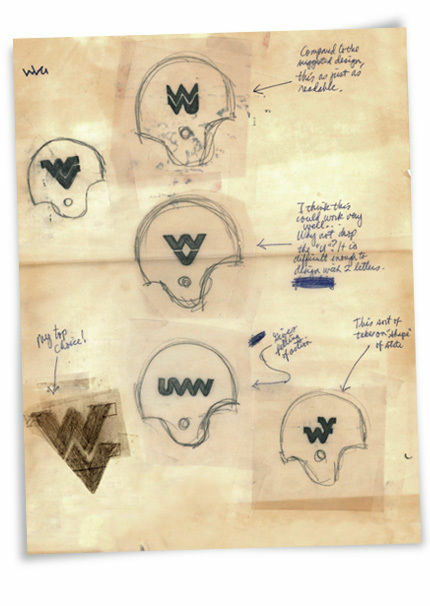 John Martin designed West Virginia University’s logo, the Flying WV, in 1980. It has become one of the most recognizable college logos in the world. After wrapping up five years with a winning record as Mountaineer head coach, Bobby Bowden left the helm in 1975 for a warmer climate at Florida State. There, he’d go on to establish a legendary 34-year career leading the Seminoles to two national championships. What could have been. The artist’s original sketches and comments. “I can’t draw a stick man,” Kerin readily admits. “I’ve had to diffuse some of the tales from over the years. People come up to me and say, ‘You developed the logo.’ No, I didn’t. I didn’t design it.” The concept around a football logo designated to stand out and unite did emanate from Nehlen, Kerin said. A renowned portrait artist, graphic designer and illustrator, Martin had designed publication covers for multiple World Series, MLB All-Star games, and anNBA All-Star game. He’d done work for several professional sports teams including the Kansas City Chiefs, Atlanta Braves, and New York Mets. Fashion statement or badge of Mountaineer pride? Whatever the reason, big-name celebrities have donned the Flying WV. And whenever this occurs, the Mountaineer nation goes bonkers by lighting up online blogs, message boards, and social media sites. In 2011, actor Leonardo DiCaprio popped up all over the globe sporting a WVU cap. He was spotted wearing it in London, at a World Cup soccer event in South Africa, at the NBA Finals, and at Target. DiCaprio has not lived in West Virginia or attended WVU. Maybe he just has great taste. Meanwhile, West Virginia natives Jennifer Garner, Brad Paisley, and Randy Moss frequently wear WVU gear. Here are a few examples of the Flying WV worn by the stars. Big-name celebrities such as Leonardo DiCaprio, Ben Affleck, Jennifer Garner, Brad Paisley, and Randy Moss have been spotted in WVU gear.